HOW TO COME UP WITH YOUR SPORTS NICKNAME. 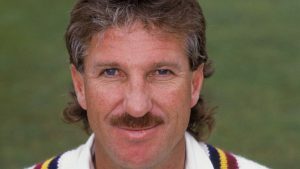 FAVOURITE CRISP: Perhaps the most well-known nickname in UK cricket belongs to mulleted cricketer Ian ‘Beefy’ Botham. A big fan of Monster Munch, Ian would often demolish 3-4 bags of the Roast Beef variety before every game (sometimes during), earning him the name…and his own private changing room (due to smell). HOBBIES: When skateboarding legend Tony ‘The Birdman’ Hawk needed a nickname, he looked to his other hobby: Pigeon Fancying. Sharing his time equally between ‘popping ollies’ and caring for over 50 ‘flying rats’, the name would perfectly reflect his favourite pastime. An ironic hobby for a man named Hawk: an animal that would rip the carcass of a pigeon like a pinata given the chance. FAVOURITE FILM: When Stuart ‘Psycho’ Pearce got his nickname, many fans presumed it was because of his very public love of the movies of Alfred Hitchcock. Only the players on his team knew the real reason: at the end of a game, Stuart would always carry a large breadknife into the shower. SPONSORSHIP: If you were born before 1984, chances are you grew up without learning two important bits of information: a/ Michael Jordan was about to take the world by storm with his phenomenal basketballetry b/ as humans, we need oxygen to breathe. In a bid to get people to understand the latter, the US government sponsored Michael to take on the classic name ‘The Air’. COMMIT A CRIME THAT IS A PUN OF YOUR NAME: What came first, the chicken or the egg? When Scottish footballer ‘Duncan Disorderly’ Ferguson took a few too many drinks before climbing into a Renault, fans questioned just that – did he do it because Jaegerbombs, or for the nickname? One thing was for sure – he’d joined a long line of rhyming, criming sportspeople (see ‘Betty Theft’ Harrison and ‘Ian Decent-Exposure’ Smith). Good luck coming up with your own! Previous Previous post: LONDON PREVIEWS!